Add a DB25 parallel port to any PC or laptop with a free USB port. 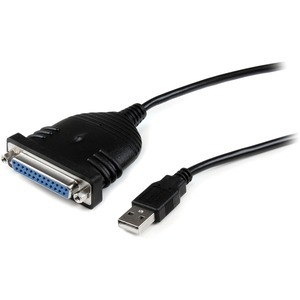 The ICUSB1284D25 6 ft USB to DB25 Parallel Printer Adapter Cable turns an available USB port on a host PC into a DB25 Female Parallel port - allowing you to connect a DB25 printer to the computer as if the necessary parallel port was built-on. A cost-effective and reliable solution, the USB to DB25 adapter saves the expense of replacing a parallel printer for the sake of USB capability. Backed by a StarTech.com 2-year warranty and free lifetime technical support .